The Tolkien modules of the '90s were mostly a recycling of '80s products, marked by a disappointing change in trade dress and cover design that gave them a more mainstream appearance. In this sense, perhaps, the handwriting was on the wall for ICE's bankruptcy as much as TSR's at this point in time, and if the Tolkien Enterprise fascists hadn't revoked the company's license in '99 for their own reasons, I wonder how long it would have lasted anyway. This isn't to say that nothing good came out of the '90s, and The Shire -- published only four years before ICE's demise -- was long overdue. It's also ridiculously huge, clocking in at 276 pages, but then I suppose Tolkien's brainchildren deserve no less. 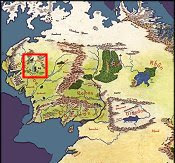 Middle-Earth, of course, wouldn't be half as compelling without hobbits, not least because they're so out of place. They're modern English peasants in a medieval feudal world, and The Shire fleshes out the anachronisms: the use of surnames, reflecting common property rights instead of noble; the dislike of politics, and love of meals and festivals around hard labor; and the disdain of artistic imagination and scholarly endeavors, for which Bilbo, of course, was derided as a crank. 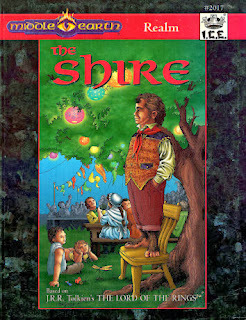 This is all superbly integrated into the Shire's geography, sandwiched in between Arthedain and Cardolan: "Hobbits have an open, cheerful nature that attracts them to Cardolani traditions -- and most Shire-folk have ancestors born in that country -- but their need for a safer life draws them to the stricter laws and stability of Arthedain." And while not taken seriously by other races, something about their inherent innocence taps into dreams shared by the Siragale elves, Arthedain philosophers, and a wizard like Gandalf, since all of these know distant pasts when people lived in relative peace and without fear. King Argeleb's granting of the Shire in 1601 makes sense in this context (even if it also played into his agenda of weakening noble rights), as well as the subsequent motivations of the rangers to guard the Shire's borders. Famous hobbits from different eras are detailed, including Marcho and Blancho at the Shire's founding, Bilbo and Frodo during the War of the Ring, and many others. There is a fabulous section on fireworks, a dozen different kinds, and let me list them: backarappers (candles that create small flame), crackers (sudden sharp flashes and noise), dwarf-candles (colors in small fountains with musical hissing), elf-fountains (a myriad of colors spewing with complete musical phrases, with partially formed illusions of butterflies and flowers), goblin-barkers (small fountain effects with repeated growling and barking sounds, often used by hobbits to scatter flocks of sheep), punks (slow-matches that are rainproof), set-pieces (ground-based displays like the flying dragon for Bilbo's farewell party in the book), rockets (air explosions like the flying dragon for Bilbo's farewell party in the film), sparklers (fountain effects of bright sparks which can panic undead), squibs (minor hissing and squealing pops), thunder-claps (booming noises causing stun), and torches (cylinders the size of dagger handles gushing forth plumes of intense multi-colored light). I adore this catalog, and it's a perfect example of the sort of cultural paraphernalia that the ICE modules tease out so well. The mapwork is first rate: superb color inserts at the center, with a detailed gazeteer explaining all the noteworthies. Then there are migration charts which chronicle the stages of Harfoot, Fallohide, and Stoor movements from the Anduin Vale to Rhudaur and Cardolan (1100s-1150s), then to Bree (1300s), and finally to the granting of the Shire territory in 1601. Overviews of Eriador are provided for both 1640 and 3018, as the module tends to split its focus between these two time periods. Arial views of hobbit villages -- Hobbiton, Michel Delving, Sackville, and Bywater -- are also shown for both time periods, with some interesting evolutions. Most enjoyable are the layouts of famous hobbit holes: Bag End, Tookbank, and Brandy Hall. Bag End is even larger than I would have guessed, though Bilbo sealed off a number of rooms after inheriting the place from Bungo and Belladonna in 2934. The elvish glade of Woodhall (where Frodo enjoyed a respite with Gildor) is a special treat, with its magical wards and specially woven thickets keeping it safely concealed. Also detailed are typical elvish tree villages, and the effects one suffers when attempting to follow an elvish trail in the Siragale: feelings of misdirection, treadmill sensations of not getting anywhere, passing through obstacles (like ravines and dense brush) and emerging up to a mile elsewhere. If there's a criticism I have about The Shire, it's that it's all too easy to be misled by it and succumb to caricatures of hobbits as happy-go-lucky optimists living without a care in an idyllic paradise. In fact they were Tolkien's quintessentially hopeless heroes, as pessimistic as the other free peoples, their fatalism obscured by an eternal cheer which was the ironic byproduct. Frodo of course was a foreordained failure, ultimately unable to resist the Ring (the cause, not the hero, was triumphant only because of fate's intervention through Gollum), and he, like any hobbit, expected evil to have the final say; as he reminds Sam, reciting as a general proverb, "It's like things are in the world: hopes fail." Sam, for his part, "never had any hope in Frodo's quest from the beginning, but being a cheerful hobbit he had not needed hope". There's something weirdly liberating about the idea that since things must turn out badly in the end, they can only be better in the meantime -- and that's hobbits in a single sentence. While the module doesn't exactly contradict this theme, it doesn't convey it either. I'm not saying I expect heavy doses of philosophy on the "long defeat" in a gaming module. RPGs are about escapism, after all, but herein lies a problem: The Lord of the Rings is the opposite of escapist fantasy, and gaming is about authentic role-playing. To those who feel there's enough of the long defeat in real life, and that we retreat to any RPG precisely to escape it, I counter that Middle-Earth, especially the Shire, isn't the best sandbox for that kind of escapism. Next up: Bree and the Barrow Downs. This is one of the MERP sourcebooks I do not have. Truth to be said, I didn't botter; I expected it to be just a remaking of the material on The Shire found in the Arthedain and various Arnor modules. As you explain it I was wrong. I find the profecies, the fireworks and the elvish magic... genial! If you ask me, so is how I feel magic in Middle-earth should be; a shame that the other MERP products had so a different view on it. I've always been divided on the nature of magic in Middle-Earth. On the one hand, it should be more disciplined, subtle, and crafted to suit Endor's mythical backdrop. On the other, I don't care for (the MERP) rules which micromanage spell use to the extent that it becomes a threat to one's soul if not cast for precisely the right reasons. But yes, the firework magic here is delightful.